Technology for precise and efficient genetic editing is constantly evolving and is now capable of human clinical applications. Autoimmune and inflammatory diseases are chronic, disabling, sometimes life-threatening, conditions that feature heritable components. Both primary genetic lesions and the inflammatory pathobiology underlying these diseases represent fertile soil for new therapies based on the capabilities of gene editing. The ability to orchestrate precise targeted modifications to the genome will likely enable cell-based therapies for inflammatory diseases such as monogenic autoinflammatory disease, acquired autoimmune disease and for regenerative medicine in the setting of an inflammatory environment. Here, we discuss recent advances in genome editing and their evolving applications in immunoinflammatory diseases. Strengths and limitations of older genetic modification tools are compared with CRISPR/Cas9, base editing, RNA editing, targeted activators and repressors of transcription and targeted epigenetic modifiers. Commonly employed delivery vehicles to target cells or tissues of interest with genetic modification machinery, including viral, non-viral and cellular vectors, are described. Finally, applications in animal and human models of inflammatory diseases are discussed. Use of chimeric autoantigen receptor T cells, correction of monogenic diseases with genetically edited haematopoietic stem and progenitor cells, engineering of induced pluripotent stem cells and ex vivo expansion and modification of regulatory T cells for a range of chronic inflammatory diseases are reviewed. Many chronic human autoimmune and autoinflammatory diseases require indefinite therapy. Despite major developments in molecular mechanism-focused therapy for rheumatic conditions in the past several decades, substantial morbidity and mortality still attends these diseases. Emerging gene therapy approaches offer the promise of more specific and durable treatments that may circumvent toxicities of traditional medical management for inflammatory disease. Rare periodic fever syndromes with monogenic causes are clear candidates for potential application of genetic modification therapy. Of course, the aetiology of most chronic inflammatory disorders is complex, involving contributions of multiple genetic and environmental factors. Nonetheless, the explosive growth in technology for precise and robust genetic editing over the past decade has generated interest in using targeted genetic modifications for the treatment of these acquired polygenic inflammatory diseases as well. The principle of gene editing involves deliberate and specific modifications to genomic DNA or mRNA with the intent to modify gene product expression, structure or function. Chromosomal DNA modifications rely primarily on the ability to generate double-stranded breaks (DSB) that serve to localise targeted changes to the effected DNA. Clustered regularly interspaced short palindromic repeat (CRISPR)/CRISPR-associated protein (CRISPR/Cas9) has rapidly become the tool of choice to this end, but older techniques such as zinc-finger nucleases (ZFN) and transcription activator-like effector nucleases (TALEN) have been used extensively. New applications of the nuclease Cas9 have the potential to greatly expand our ability to manipulate nucleic acids and protein expression, structure and function. Emerging technologies such as base editing, activation or repression of transcription via Cas9-targeted transcription factors or Cas9-targeted epigenetic modifiers and RNA editing are novel technologies that could greatly expand our ability to discretely control pathobiology. Viral and non-viral vectors can be employed to deliver effectors of genome editing to the cell or tissue of interest, including T cells, haematopoietic stem cells (HSC), induced pluripotent stem cells (iPSC) and organ parenchymal cells. NHEJ, in contrast, is the most common manner of DSB repair in mammalian cells, is active during all phases of the cell cycle5 and does not require a homologous template for repair. Due to the latter, NHEJ can create insertions and deletions of varying sizes (termed ‘indels’) at the repair site, which can mutate the protein coding sequence in a negative fashion. Thus, the method of DSB repair is an important consideration when crafting experimental techniques for genome editing. Investigation of inflammatory disease pathobiology has flourished with the modern capabilities of genome editing. Using conventional and conditional targeted murine alleles, as well as reporter genes, and mice humanised to express human genes and gene variants, the biology of major inflammatory states, such as rheumatoid arthritis and systemic lupus erythematosus, has been rigorously addressed both systemically and at the tissue level. In some instances, this has led to the development of highly potent targeted therapies. Modern techniques for manipulation of the genome are increasingly precise, efficient and facile. The rapid development and capability of the technology will undoubtedly foster increasingly insightful biologic discovery and efficacious therapies for both immune and inflammatory disorders. In this section, we provide a brief history of older tools of genome editing, many of which are still used today, and review state-of-the-art technologies for genetic manipulation of human inflammatory disorders (table 1). Single-stranded oligonucleotides and meganucleases were initial forays into gene editing. Both are inefficient, difficult to use and have variable specificity.6–11 ZFNs are artificially engineered endonucleases that represented a significant step forward in efficiency and capability.12 13 They have been used in multiple applications in human and animal models.14–16 However, there is lingering concern over ZFN off-target effects,17 and the time, difficulty and sophisticated laboratory methods required for their design and construction. The CRISPR/Cas9 system is a defence mechanism found in bacteria and archaea.21 22 CRISPR sequences consist of small unique ‘spacer’ sequences, which are interspersed in stretches of highly conserved repetitive DNA sequences, termed ‘CRISPR repeats’, typically located next to groups of highly conserved protein-coding genes called CRISPR-associated (cas) genes that often carry domains similar to nucleases, helicases, polymerases and nucleotide-binding proteins.21 22 The combination of spacer sequences complementary to intracellular but foreign nucleic acids and the Cas9 nuclease fosters degradation of the foreign genetic material and protection from pathogens. 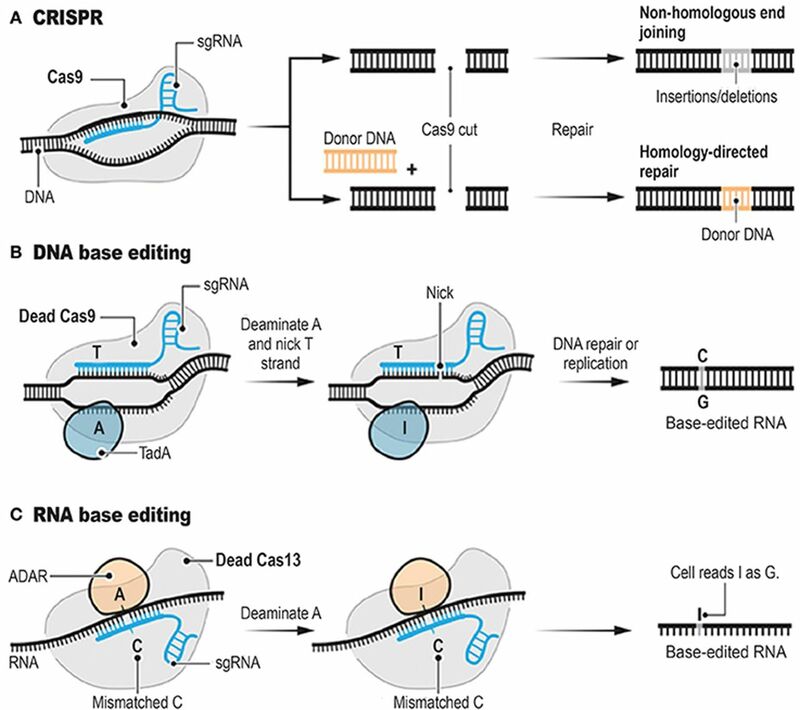 CRISPR/Cas9 is versatile, efficient, simple to design and use, increasingly specific and is rapidly supplanting other modalities of gene editing.26 Moreover, its functionality is also being broadened. Using multiple gRNAs with the same Cas9 nuclease allows for targeting multiple genes simultaneously.30 31 A single amino acid substitution in either of the two-nuclease domains of Cas9 results in a ‘nickase’ that cleaves only one strand of DNA,32 potentially reducing off-target effects. The refinements of CRISPR/Cas9 and other microbial endonucleases33 34 have resulted in CRISPR/Cas9 rapidly becoming the workhorse for a range of applications including gene therapy, functional genomic screening, transcriptional modulation and synthetic biology. Historically, genetic modification has relied on the ability to create a DSB at a specific site of interest and to use the endogenous cell repair machinery for HDR or NHEJ (figure 2A). Methods that induce DSBs have been plagued by ‘off-target’ random insertions or deletions (indels) of variable predictability, and by low efficiency under circumstances practical for therapeutic development, including modification of non-dividing cells.30 32 Komor et al designed and tested a novel method of generating single base pair changes without first generating a DSB.35 The group recognised the capacity of ‘dead’, enzymatically inactive, Cas9 to retain its ability to target and bind DNA in a guide RNA-directed manner. They sought to couple this function with the ability to make a base substitution without a DSB (figure 2B). They then used cytidine deaminases to catalyse the deamination of cytosine (C) to uracil (U), which binds complementary bases like thymine (T). This method is synergistic with the effects of Cas9 in that on binding of the sgRNA/Cas9, nine nucleotides of DNA are unpaired to a single strand,36 with single strandedness being a requirement for cytidine deaminase activity.37 Using a chimeric fusion protein comprising rat-derived cytidine deaminase APOBEC1 fused with nuclease-deficient Cas9, the group observed base editing efficiency rates as high as 37% with a 1.1% indel formation rate. These rates compared favourably with standard wild-type Cas9 and sgRNA, reagents which averaged 0.5% efficiency with a 4.3% indel formation rate. A second form of fusion protein was slightly less efficient but with even lower indel formation rate. Proof of principle experiments showed that human disease-associated mutations could be corrected in mouse astrocytes and human breast cancer cell lines using base editing techniques. There is considerable interest in using the specificity of Cas9 and related nucleases in conjunction with sgRNAs for transient, targeted modification of gene expression, structure or function. Post-transcriptional modification of mRNA is natural biologic process and synthetic modifications would be limited by the degradation of the mRNA and subsequently translated proteins. Cox et al described a method harnessing the specificity of CRISPR-associated RNA-guided ribonuclease Cas13 fused to adenosine deaminase acting on RNA 2 (ADAR2) for targeted modification of specific RNAs by deamination of adenosine to inosine, which is equivalent to guanosine in translation and splicing.38 The investigators created a mutated ADAR2 deaminase domain with relaxed sequence constraints to increase editing efficiency and fused it to catalytically inactive Cas13 (figure 2C). They were able to demonstrate RNA editing for programmable A to I (G) replacement of reporter, endogenous and disease-associated transcripts. However, many off-target events were observed adjacent to the guide RNAs. The investigators then determined that the ADAR2 motif of their fusion protein was responsible for the off-target mutations and performed rationale mutagenesis to enhance specificity to the intended target site. Editing nucleic acid sequence with this tool offers several advantages including the lack of a prerequisite sequence constraint such as a PAM, activity only on transcribed sequences, direct deamination without requiring endogenous repair pathways and, lastly, the transient nature of RNA rather than DNA modification. To achieve successful targeted gene therapy, efficient delivery vehicles and vectors are essential. Plasmids encoding proteins responsible for genome editing must successfully enter the nucleus of targeted cells in order to facilitate transcription and eventually translation.48 The cell and nuclear membrane are physical barriers to the passage of large hydrophilic molecules like DNA, RNA and proteins. Furthermore, DNA, RNA and protein are all subject to intracellular and extracellular degradation by nucleases and proteases.49 Methods for circumventing the physical and degradative barriers to delivery can generally be divided into viral vectors, non-viral vectors, non-vector agents and cellular delivery vehicles. In general, non-viral delivery vectors include nanoparticles and cationic carriers. Nanoparticles may comprise genomic material complexed with cations, allowing endocytosis and cell membrane transfer of negatively charged DNA. Cationic nucleic acid carriers can be divided into lipid-based agents, such as lipofectamine, and polymeric.59 These non-viral vectors offer several advantages including transient expression, the capacity for repeated administration, potential for larger strand genomic delivery and possibly improved efficacy.60 Lipofectamine has been used for successful delivery both in vitro and in vivo, as well as for CRISPR/Cas9-mediated modification of murine iPSCs.61 However, in general, these agents have to date not been used extensively in clinical application. Gene editing can also be performed on cells ex vivo. After return to the host, gene-edited cells may elicit long-lasting biologic effects. Chimeric antigen receptor (CAR) T cells have had remarkable success in treatment of otherwise lethal haematological malignancies and have been shown to expand and persist during and after treatment.62 Briefly, T cells are isolated from human subjects by leukapheresis and gene editing performed ex vivo to induce expression of an extracellular single-chain antigen-binding domain (scFv) fused to CD137-CD3z signalling domains.63 The resultant modified CAR T cells are then reinfused to the host for targeted effector function. T lymphocytes have tremendous capacity to drive immune response—both adaptive and pathologic—in an antigen-specific manner. Gene therapies that seek to capitalise on the narrow specificity and cytotoxic potential of T cells are under study in a number of autoimmune diseases. Due to the non-specific nature of current immunosuppressive treatment protocols, there is considerable interest in disrupting pathologic components of the immune system while otherwise preserving its natural function (figure 3). 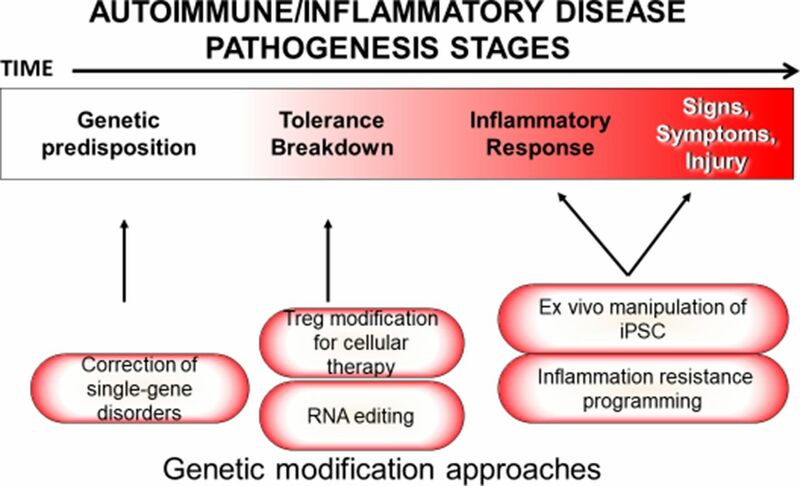 Pathogenetic stages and methods by which inflammatory disease could be treated by gene editing at each stage. iPSC, induced pluripotent stem cell; Treg, T regulatory cell. Ellebrecht et al reported a murine proof of concept using modified T cells for the treatment of the autoimmune skin disease pemphigus vulgaris (PV).70 The authors reasoned that T cells could be genetically modified to specifically recognise and eliminate pathogenic B cell clones that express autoreactive antigen receptors while maintaining the rest of the B cell compartment. The approach of targeting individual B cell clones differs from conventional anti-CD20 therapies, which deplete the entire CD20 B cell compartment. They studied PV because epitopes targeted by pathologic antibodies are well described. To specifically target the pathologic autoantibody-producing B cells, they used a lentiviral vector to genetically modify T cells to express autoantigen desmoglein (Dsg) 3 fused to CD137-CD3z signalling domains. Resulting chimeric autoantibody receptor (CAAR) T cells were then infused to treat animal models of PV, including a humanised mouse model of disease. CAAR T cells were found to expand, persist and exhibit cytotoxicity against cells expressing anti-Dsg3 B cell receptors in diseased recipients in vivo. Histopathologically, the CAAR T cell-treated mice showed an absence of IgG deposition in mucosal samples and no histologic blister formation. CAAR T cells were able to infiltrate the epidermis in a human xenograft model and similarly ameliorated the disease process. Importantly, cytotoxicity occurred without apparent off-target toxic effects. WAS is not the only human condition in which enthusiasm for genetic modification approaches has been tempered by safety concerns. Attempted treatment of severe-combined immunodeficiency was marred by leukaemogenic transformation secondary to retroviral insertion of enhancers of oncogenic genes.52 More recently, use of an AAV for in vivo transduction of spinal alpha motor neurons in non-human primates and piglets with a human SMN transgene resulted in severe hepatitis and degeneration of the targeted tissues.88 These outcomes suggested an ongoing need for careful preclinical and clinical safety studies when manipulating the genome for therapies of human disease. This is especially true for many of the monogenic autoinflammatory diseases which pose lesser morbidity and mortality threats compared with severe syndromes such as WAS. In some autoinflammatory syndromes, such as FMF, CAPS and TRAPS, the pathogenic cell type is likely to be bone marrow derived and radio and/or chemotherapy sensitive. These conditions thus represent ideal first targets or ‘low-hanging fruit’ for cure or amelioration with genetic modification of haematopoietic cells. In contrast, tissue injury from interferonopathies such as SAVI and CANDLE is likely to be caused by complex multicellular gene-phenotype interactions, and thus strategies targeting multiple cell types and tissues will be required. While still their infancy, highly efficient base editing techniques (see section above) may make genetic editing for both lethal and non-lethal monogenic disease a tenable strategy. There is considerable interest in genetically modifying iPSCs for the treatment of human disease. Advantages of iPSCs include their potential durability in vivo, their ability to differentiate into tissues affected by chronic inflammatory diseases and the ability to create abundant quantities without the use of embryos or other products of conception. One approach for the use of genetically modified iPSCs is known as closed-loop biologic drug delivery system. Anticytokine therapies with monoclonal antibodies and decoy receptors have revolutionised the treatment of chronic inflammatory diseases in the last two decades.89 However, targeting key proinflammatory molecules such as TNF-α or interleukins (IL) entails a risk of side effects, including infections, and requires constant dosing and patient exposure to the drug which may interfere with the pleiotropic roles of the targeted cytokine.90 To address the problem of non-specific loss of cytokine function in all tissues created by such therapies, Brunger et al sought to engineer resistance to cytokine function only among cells of interest. They modified murine iPSCs using CRISPR/Cas9 to insert anti-inflammatory molecules (eg, IL-1Ra or chimeric human sTNFR1-murine IgG) in the Ccl2 locus.91 The Ccl2 gene product regulates trafficking of inflammatory monocytes/macrophages, basophils and T lymphocytes in response to inflammatory cues such as TNF-α and IL-1.92 The inserted naturally occurring cytokine antagonists within the Ccl2 locus mitigated the inflammatory effects of physiologic concentrations of IL-1 and TNF-α when the iPSCs were cultured in monolayer as well as after differentiation into engineered cartilage tissues. The engineered cartilage tissues were observed to be resistant to the pathophysiologic effects of IL-1 and TNF-α. The authors proposed that this approach could be used for a targeted cell-based anticytokine vaccine. Osteoarthritis (OA) is a highly prevalent disabling disease for which disease-modifying therapy (other than joint replacement) has not been identified. However, OA joints are characterised by the presence of proinflammatory cytokines,97 98 which could hinder the therapeutic effect, engraftment and/or longevity of stem cell-based therapy in that milieu. Rather than utilising genetically engineered iPSCs to modify inflammatory signalling at the local tissue level, Brunger et al used CRISPR/Cas9 to engineer murine iPSCs to be inflammation resistant61 with the aim of utilising the engineered cells for regenerative medicine in a hostile, inflammatory microenvironment. They deleted the IL-1 receptor type 1 gene, selected clones with homozygous deletion and used specific differentiating factors to generate cartilage from the edited iPSC clones (figure 4). The resulting genetically modified cartilage was resistant to cytokine-mediated tissue degradation relative to wild-type and heterozygous clone cartilage. Webber et al also used iPSCs to explore the possibility of tissue regeneration in recessive dystrophic epidermolysis bullosa, a severe disorder caused by mutations to the COL7A1 gene that causes life-threatening derangement of skin integrity.99 Patient-derived primary fibroblasts were isolated and the COL7A1 gene defect restored to wild-type status using CRISPR/Cas9. Genetic modification was assessed and found to be specific to the intended locus apart from a single, predicted off-target modification in a clone treated with Cas9 nuclease rather than the nickase. iPSCs were generated from the modified fibroblasts and showed ability to differentiate into keratinocytes, mesenchymal stem cells and HSCs. Finally, in a manner analogous to the generation of CAR T cells for therapy of malignancy, Tregs can be engineered to express extracellular scFv or antigenic domains fused to downstream intracellular signalling molecules. Antigen-specific chimeric receptors have been used in murine experimental autoimmune encephalitis (EAE)111 112 and a murine model of inflammatory bowel disease.113 114 There are ongoing efforts to examine the utility of citrullinated-peptide-specific CAR Tregs for the treatment of rheumatoid arthritis.115 Chimeric autoantigen receptor Tregs have been studied in a murine model of haemophilia A with autoantibody formation to factor VIII.116 Autoantibody-producing B cells were able to be ‘tolerized’ and autoantibody production halted. The technology for and application of RNA editing is still in its infancy relative to the technologies for making permanent changes to the genome. However, there are speculative applications of RNA editing for inflammatory diseases. Cox et al were able to repair transcripts of the 878G>A (AVPR2 W293X) mutation associated with X linked nephrogenic diabetes insipidus and the 1517G>A (FANCC W506X) mutation associated with Fanconi anaemia.38 They also suggested the possibility of utilising similar methods for correction of any of the thousands of G to A mutations associated with pathologic states, potentially offering the ability to mimic protective alleles for at-risk individuals during times of immunologic and inflammatory stress. The technology to manipulate genomic material has allowed tremendous discovery in the biology of inflammatory disease. While still in its infancy, genetic editing is now, decades after the discovery of the nature and structure of DNA, entering the realm of therapy (table 2). This is particularly true for severe monogenic disease. There are several apparent niches for gene editing in the treatment of inflammatory diseases, including correction of monogenic autoinflammatory syndromes, CAAR T cell therapy for autoantigen-specific targeting of pathologic B cell clones, modification of iPSCs for controlled cytokine delivery and tissue regeneration and Treg-based therapies. As technology matures, cell therapies based in genome editing will likely strive towards the ‘holy grail’ of autoimmune disease therapy, that is, targeted inhibition of the pathologic components of the immune system without necessitating generalised immunosuppression. New tools for transient modification of protein structure, function and expression will allow us to fine-tune the delicate balance the immune system maintains between defence and tolerance to self. Harnessing the inherent specificity of our own immune system to target pathologic B or T cell clones, particular cellular subsets necessary for disease or disrupt trafficking to affected tissues will likely become feasible in the near future. Specific therapy will more potently inhibit the inflammatory processes yet spare the remainder of the immune system. But therapies utilising genetic editing will likely expand beyond ex vivo modification of cells of the immune system when we can reliably target certain cell types or tissues in vivo. One can imagine stepwise approaches for targeted genetic honing to redirect from inflammation to homeostasis in chronic inflammatory diseases affecting a particular organ or cell type. Addition to or antagonism of various growth factors targeted to organ parenchymal or interstitial cells could potentially be applied to fibrotic inflammatory diseases, which at present have a paucity of treatment options. Furthermore, more elegant and coordinated control of gene expression could allow the capability to generate replacements for organs or tissues damaged by inflammation, such as a biologic rather than plastic and metallic replacement for a joint with end-stage OA. 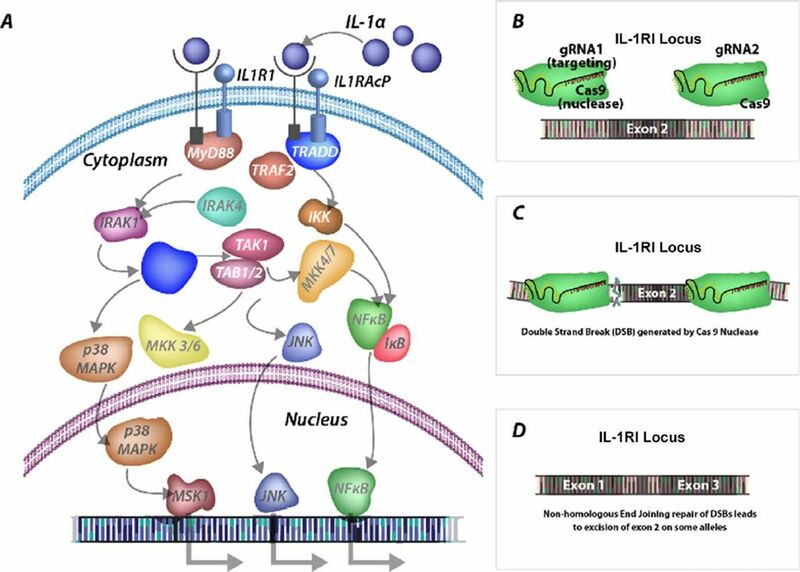 The increasing capability, ease of use and reliability of modern tools for gene editing will undoubtedly lead to new pathophysiologic insights and therapies for immune and inflammatory diseases.
. Site-specific recombination determined by I-SceI, a mitochondrial group I intron-encoded endonuclease expressed in the yeast nucleus. Genetics 1992;130:451–60.
. Neurologic phenotypes associated with mutations in TREX1, RNASEH2A, RNASEH2B, RNASEH2C, SAMHD1, ADAR1, and IFIH1: Aicardi-Goutieres syndrome and beyond. Neuropediatrics 2016;47:355–60.
. The Wiskott-Aldrich syndrome and X-linked congenital thrombocytopenia are caused by mutations of the same gene. Blood 1995;86:3797–804.
. Anti-cytokine therapies. In: Firestein GS , Budd RC , Gabriel SE , McInnes I B , O’Dell JR . eds. Kelley and Firestein’s Textbook of Rheumatology. 10th edn: Elsevier Inc, 2017:999–1019.
. Nuclear factor-kappa B p65 mediates the assembly and activation of the TNF-responsive element of the murine monocyte chemoattractant-1 gene. J Immunol 1999;162:727–34. Contributors All authors contributed to the conception and design as well as the literature review for this work. Each participated in drafting and revising the important intellectual content and approved the final version to be published. All are accountable for all aspects of this work.